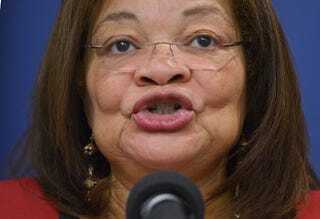 Alveda King, an outspoken pro-life advocate and the niece of civil rights icon Martin Luther King Jr., confirmed that she voted for Donald Trump for president on Monday, when the whole nation was celebrating her uncle and his works, the Washington Examiner reports. According to the report, King confirmed her vote in a statement to the American Thinker blog, after having spoken positively about the now president-elect during his campaign. “I pray that all polar opposites learn to Agape Love, live and work together as brothers and sisters—or perish as fools. While I voted for Mr. Trump, my confidence remains in God, for life, liberty and the pursuit of happiness. Prayers for President-elect Trump, Congressman Lewis, and everyone including leaders,” King, an avid pro-life supporter who serves as the director of Civil Rights for the Unborn, said in the statement. She also weighed in on Trump and Rep. John Lewis’ exchange after Trump tried to come for Lewis, an iconic civil rights activist in his own right. Lewis had openly criticized Trump during an NBC News interview, saying that he did not see Trump as “a legitimate president,” and voiced his intent to pass on Friday’s inauguration. Alveda King opined that Lewis’ skills in nonviolent conflict resolution were not being used in the current political climate. Read more at the Washington Examiner and Fox Business.